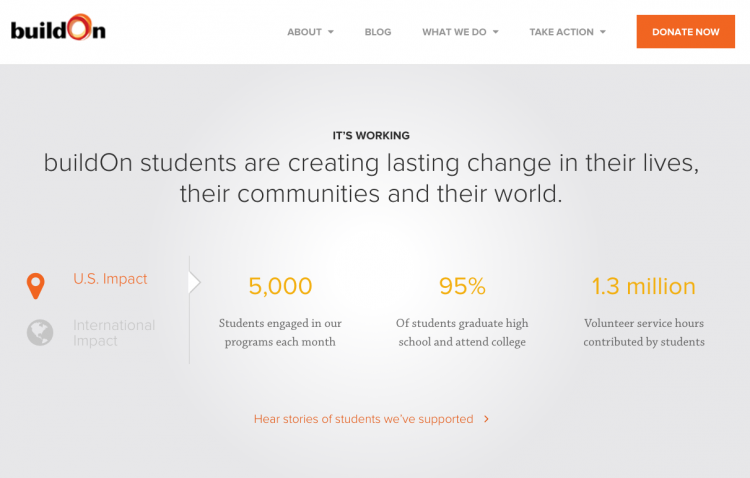 These days, there are lots of great nonprofit websites to behold. An easy-to-use and beautiful website is a must. And when you want to raise money online (which you should), you’ll definitely need a cyber-hub for donations, discovery and support. Most likely you established a website far before even officially becoming a 501(c)3. What isn’t so obvious about building a website is what kind of website. 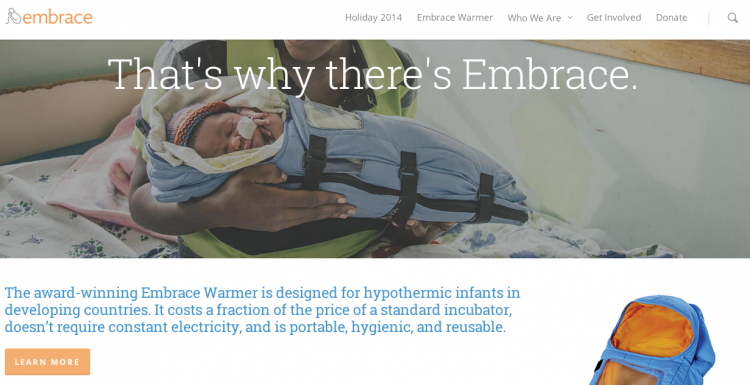 Take note: your website’s design can directly affect your online fundraising efforts. In countless studies, stat roundups, and tests, the results are clear – there is such a thing as web design that will be a barrier to generating conversions (the term conversion refers to a person who visits your site and then performs an action you’d hoped, like making a donation). You want your website to be very straightforward, uncluttered and easy to navigate. 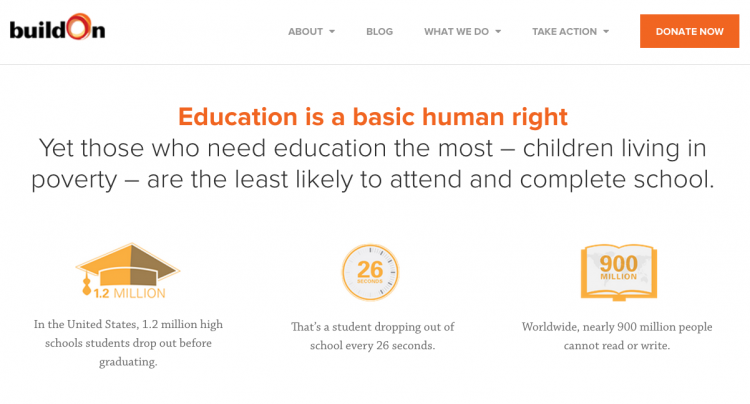 We’ve compiled some attributes awesome nonprofit website design should have, followed by examples of each. 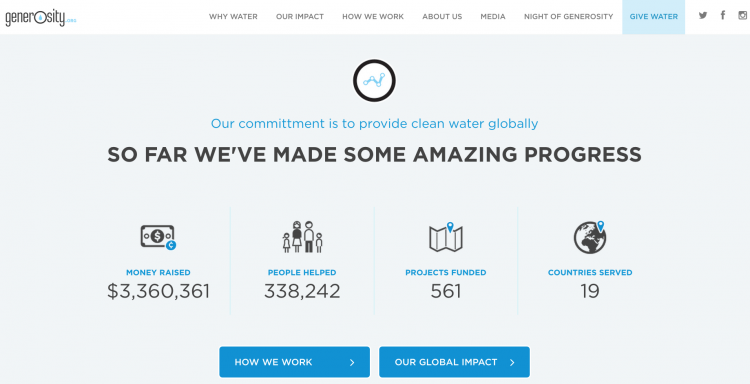 Clear donate button – You want people to donate to your nonprofit right? Of course! The donate button should be visible on every page of your site. 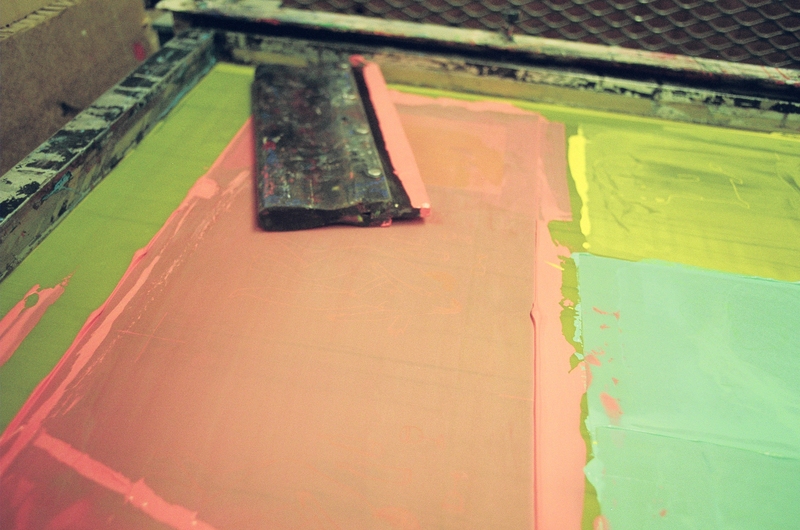 Make it stand out by using a color that contrasts to the rest of your page. The problem you’re solving, how you’re solving it and why it matters for the site visitor to be involved. The stream of consciousness to scrolling down the page of your website goes something like this: awareness of a problem, awareness of a solution, motivation to become part of the solution. Now, we’ll take a look at how two organizations approach this sequence. The immediate impact of your organization – As we discussed above, you should follow up the “problem” with your organization’s explicit solution to that problem. Prove the efficacy of your solution by demonstrating impact through eye-catching graphics, stats and stories. 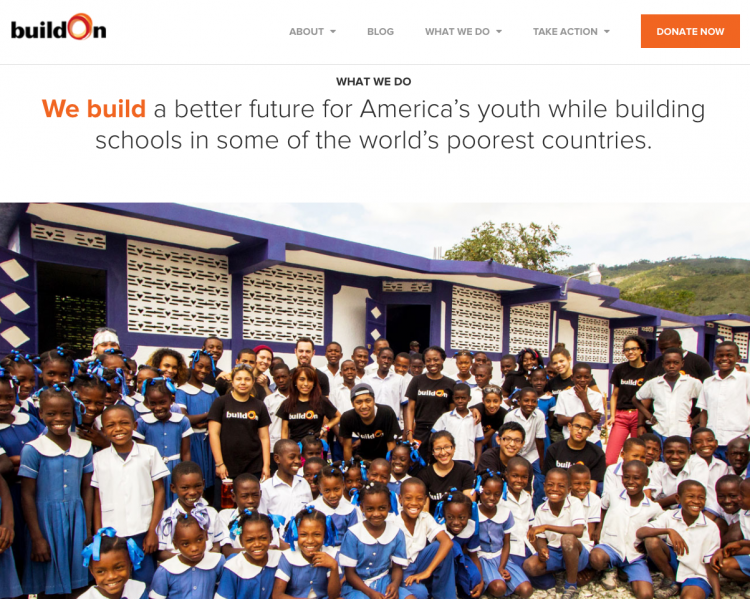 Let’s take a look at how buildOn and Embrace follow the “problem” section of their homepage. 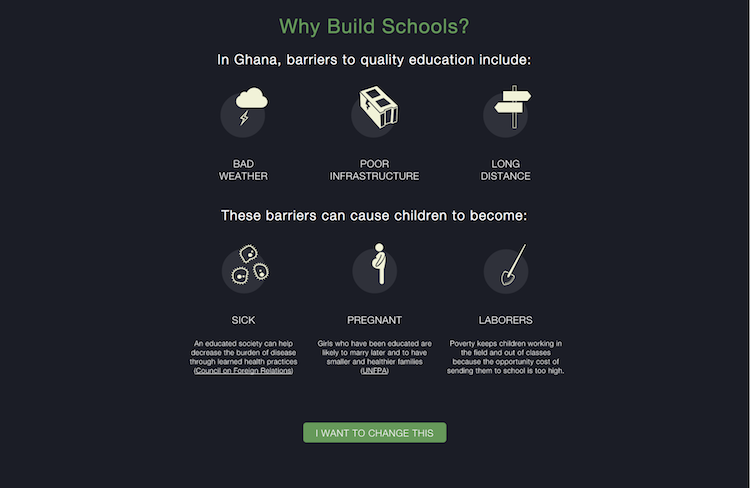 Notice how buildOn uses some stats to demonstrate impact, while Embrace uses a video and personal constituent’s story. A blog – blogging is a great way to keep people informed what you’re accomplishing in the field. Transparency is increasingly important to donors, and writing about your organization regularly is perfect for demonstrating impact, engaging supporters and sharing the work you’re doing with people new to your organization. • Behind-the-scenes videos or write-ups about your work – I love this post on Possible’s blog about how they manage projects in rural Nepal. 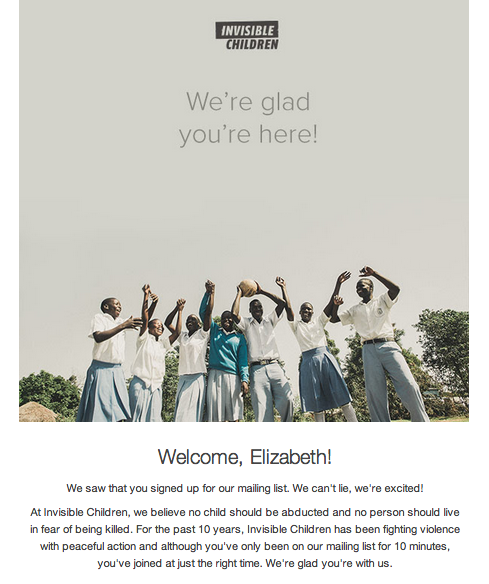 A newsletter to subscribe to – this attribute is related to the blog in the sense that newsletters increase transparency, deepen engagement and keep people up-to-date with how their support is directly impacting your cause. Apply the same principles we learned for your main website for your specific campaign microsites. For a campaign, make sure you add your campaign’s goal and campaign’s progress. Here is an incredible example from Pencils of Promise’s brand new year-end campaign microsite, frame by frame. This is, hands down, one of the best campaign sites I’ve ever seen. Not only is it very straightforward and easy to navigate, it’s exceptionally compelling by carrying a storyline from start to finish. (For a more fluid experience, visit the campaign site live, here.) Also, when you’re on the live page, note how the campaign progress bar and donate button follows you down the page. 3. Explicit Problem – p.s. 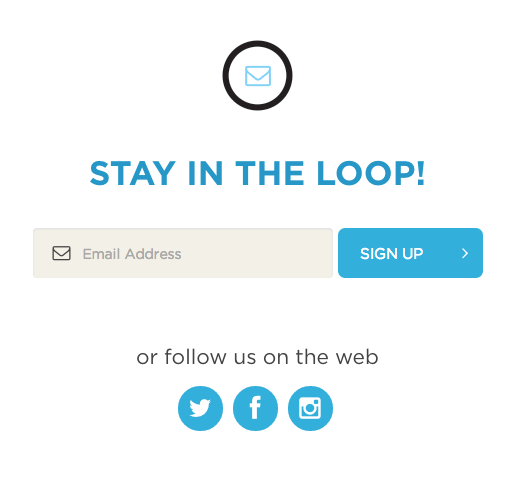 I love the “I want to change this” call-to-action immediately after the problem, for those potential supporters who are very eager to make a difference. 7. Subscribe! Note that in this case there is no blog or “updates” section. I’ll let this pass, since it’s a campaign page and not a website that represents the organization as a whole. A great nonprofit website doesn’t have to cost a million dollars, it just has to be straightforward and easy to navigate. The easier you make it for visitors to understand your mission, impact, and find what they’re looking for, the better engagement you’ll receive!